Staurolite is a gentle grounding and shielding crystal, and because of its cruciform shape, was traditionally used for protection and good luck. It is considered to be an excellent stress reliever and mood-lifter. It can create a connection between the physical and astral planes, and provides a balance between the two, and can also help organise thought patterns and ideas. It is sometimes used by those attempting to give up smoking, as smoking is often a means of keeping grounded. Staurolite forms regionally under a specific range of temperatures and conditions, in schists and gneisses and other aluminium-rich metamorphic rocks. It is usually found in association with garnet, tourmaline, kyanite and/or stillmanite. Crystals are monoclinic, and usually twinned in a cruciform (cross) shape. From Greek stauros for “cross”, alluding to the cruciform twins it displays in some cases; also known as Fairy Cross Stone. 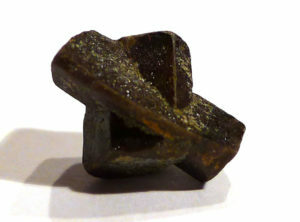 Staurolite was employed as an amulet for baptisms in Europe in the 17th and 18th centuries (possibly earlier), and worn as a charm in Brittany, where it was said they dropped from the heavens. A local legend in Patrick County, Virginia, USA, says that when the fairies heard of the crucifiction of Christ, their tears fell to the ground and crystalised in the form of the cross.